All three Bishops for The Church of England in Lancashire have written and recorded their Easter messages for 2019. 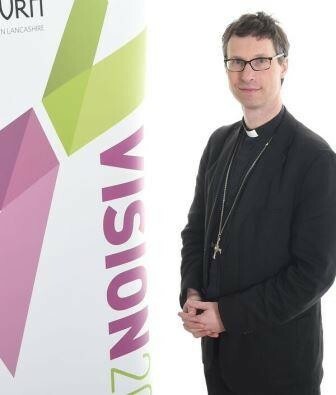 Here is the message from Rt Rev Philip North, the Bishop of Burnley, in video format first and (following below) the full text as well. Imagine you are just about to walk into a room full of people. What would be the first words you say? Some people would say nothing, they would just merge into the room, shyly, nervously, not really wanting to be noticed. Some people might utter a modest ‘hello’ or comment on the weather; others though would want to grab hold of the scene, a great fanfare, ‘Look at me, I am here’ they would say ‘the party can begin’. In John’s gospel, on the first Easter morning, Jesus walked into a room filled with disciples and He has every reason for taking that third, attention-seeking option. Think what he has just done: he has overcome the cross; he’s risen from the dead; he has brought about the new creation ‘Look at me he could say, I have only just been in a harrowed hell!’ but he doesn’t do any of that, instead he looks at the disciples and the first words he speaks are these: ‘peace, peace be with you’. That word ‘peace’ isn’t just a greeting, it’s more than that … it’s a proclamation. Now there is peace, he is saying, Now, for the very first time, you can know peace with the Father. You, whose lives are troubled and full of sin; you who are addicted to conflict; you who are anxious, worried and grief stricken; now, at last, you can know peace. The peace that Jesus is speaking about is not some human invention, no, this peace flows from a triumph of Easter. By his dying and rising, Jesus has destroyed those old enemies, sin and death, so that those who believe can live in right relationship with the Father. The peace that Jesus talks about flows straight from the Father’s heart. The peace which is the gift of Easter comes straight from God, and that is the peace that those disciples can now know. We all need peace just right now, we need peace first of all in our nation riven as it is at the moment by this endless, insidious argument over Brexit … one which is causing such disharmony, not just within our political system, but often within communities and families. And perhaps you also need to know peace in your own life, perhaps you are weighed down by anxiety or worry, or by conflict, or by a sense of sin. Perhaps there’s problems in your family or perhaps you are dealing with issues and problems where you can’t see a solution. We need peace, but that peace isn’t something that we can simply build on our own. No, that peace is a gift from God. Just as on the first Easter Day, Jesus burst into the upper room and shared His peace with the disciples, so, my prayer for you this Easter is that Jesus might burst into your heart, into your life and say to you those words of peace. May you know the peace of Easter; that peace which flows from the Father and so be able to share that peace with others. Happy Easter, halleluiah Christ is risen, he is risen indeed and may His peace be yours.